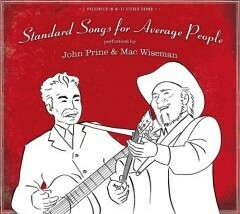 Standard Songs for Average People, John Prine and Mac Wiseman’s new album of American country classics, is one of the most unexpected musical surprises of the year, so far. A celebration and reinterpretation of lesser-known vintage material, the set exudes a spirit that is similar to the collaborations between Jerry Garcia and David Grisman during the ’90s, though the emphasis here is on natural delivery and perfectly relaxed vocals rather than stellar musicianship. While Standard Songs for Average People sounds like two old friends performing material that they have sung together for years, it was only recently that legendary Nashville producer Cowboy Jack Clement introduced Prine and Wiseman to each other. In Clement’s estimation, the two men are kindred spirits, and they are so closely aligned in how they approach a song that it is a natural step for them to attempt a collaboration. Prine apparently liked the idea, but his schedule of touring the world to sold-out houses in support of Fair & Square, his Grammy-winning outing from 2005, delayed the duo’s progress for more than a year. When Prine and Wiseman eventually spoke on the phone, they agreed to write down separate lists of songs that they wanted to record, and they were surprised to find an overlap of seven tunes that they wanted to tackle. Standard Songs for Average People is Prine’s second excursion into reinterpreting classic American material. The first — 1999’s In Spite of Ourselves — was an inspired series of country duets recorded with female artists such as Iris Dement and Lucinda Williams. While that endeavor featured bizarre covers that focused on dysfunctional relationships and weird male-female psychodramas, Standard Songs for Average People offers a selection of tracks that is more familiar to the country music-loving everyman. Artists such as Tom T. Hall and Lefty Frizell might not be household names outside of country music circles, and they are, perhaps, suggestive of the ‘redneck’ side of American roots music that often scares away rock fans. However, when Prine and Wiseman sing these tunes, a refreshing warmth and humanity flows through every note and vocal inflection. The most impressive thing about Standard Songs for Average People is how comfortable and unforced the whole proceeding sounds. When the pair got together to record at The Butcher Shoppe in Nashville, producer David Ferguson set up the studio so that Prine and Wiseman were able to sit across from each other at an old dining room table. The music that results from this arrangement is brimming with confidence, and it is so unhurried that it is hard to remember that Prine and Wiseman had never met before the album was committed to tape. From start to finish, the collection feels more like a fly-on-the-wall document of an impromptu meeting of dear, old friends than a date that was arranged by a musical matchmaker. Consequently, it’s not easy to pick a highlight from amongst Standard Songs for Average People’s contents. Suffice it to say that old, Nashville staples such as I Forgot to Remember to Forget and Blue-Eyed Elaine have never sounded as good as they do here. With this collection, Prine and Wiseman have achieved the kind of Zen purity and simplicity in their delivery that many good singers strive their whole lives to capture but never quite are able to reach. While neither Prine nor Wiseman could be considered a Caruso or a Pavarotti, the absolute clarity of purpose and absence of ego in their singing allows the material to flow through both men, seemingly without their having made any effort. Each vocalist is so utterly confident in his abilities and understanding of the music that there is no stretching, showboating, or over-emoting anywhere. Prine and Wiseman are so perfectly attuned to each other that sometimes when they shift leads, it is almost impossible to notice the change. Rather than being a criticism, their relaxed delivery and intuitive comprehension of the songs is something to envy. Tastefully supported by some of Nashville’s best session musicians — including The Grand Ole Opry’s Carol Lee Singers, who provide backing vocals throughout the set — Standard Songs for Average People sounds as if it could have been recorded at any time within the last 50 years. Neither the material nor the approach utilized by Prine and Wiseman is about to cut a swath through popular music or start a new sonic revolution. Standard Songs for Average people is content to be what it is: a wonderfully warm collection of classic tracks by two singers who, with nothing to prove, appear to be having the time of their lives performing them.